In 2014, when the San Francisco 49ers football team relocated to a new home stadium at the height of many years of drought in California, water sustainability was a high priority for designers. Installing forward-looking features such as a 2500-m2 (27,000-ft2) green roof, an innovative biofiltration system, and a display that offers information about the stadium’s real-time use of energy, water, and air cemented Levi’s Stadium’s (Santa Clara, Calif.) place as the first professional football stadium in the nation to open with a gold LEED certification from the U.S. Green Building Council (Washington, D.C.). The biofiltration system at Levi’s Stadium is only one green development that earned the venue the 2017 Environmental Award of the Year from TheStadiumBusiness (West Sussex, U.K.). Elsewhere at the facility are a large green roof, an on-site vegetable farm, solar power generators, and more. American Hydrotech/Levi’s Stadium. 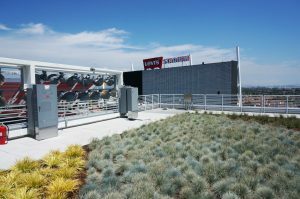 The new biofiltration system beneath the San Francisco 49ers’ Levi’s Stadium collects runoff from hardscapes on the premises and directs it away from the San Francisco Bay. Parking lots generate particularly harmful runoff because petrochemical discharges from parked vehicles are swept away with rain. Oldcastle Precast. Compared to the 49ers’ last arena, Levi’s Stadium occupies almost twice as much land, including expanded parking lots that can accommodate about double the number of attendees for each game. While the nearly 70,000-seat stadium offers the team and its fans considerably more breathing room, it also presents challenges for environmental welfare. of runoff. Even worse, rain picks up petrochemical pollutants that drip or leak from parked cars and litter from tailgaters, making stadium lot runoff even more hazardous. For Levi’s Stadium, which sits adjacent to a creek that flows into the San Francisco Bay less than 9.6 km (6 mi) away, effective stormwater management is a major concern. All-natural microbes in the biofiltration system’s filtration media layer break down pollutants, which then provide nutrients to support vegetation throughout the facility. The system also redirects excess runoff during heavy storm events into the area’s existing storm-drain system. Oldcastle Precast. To address that concern, project managers installed an underground biofiltration system beneath the facility’s hardscapes. 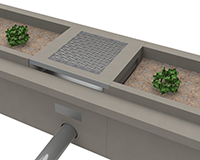 This system provides about 1300 m2 (14,000 ft2) of stormwater retention space. The system, which was designed by Oldcastle Precast (Littleton, Colo.) to accommodate a 10-year storm event, captures precipitation from parking lots. The runoff then percolates through an all-natural filtration media layer, capable of draining up to 25 cm (10 in.) of precipitation per hour, before treated water flows into a perforated pipe that runs along the bottom of the system. The pipe feeds into the existing storm-drain system that keeps runoff out of the San Francisco Bay. However, what makes this biofiltration system remarkable is its reuse of pollutants. All-natural microbes in the system’s filtration media layer break down filtered pollutants, which then provide nutrients to support vegetation throughout the facility. Additionally, drip lines provide supplemental irrigation for plants in areas that do not receive consistent or adequate rainfall. 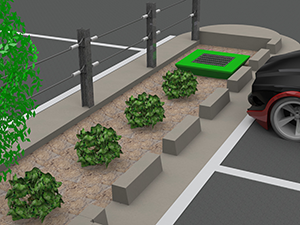 The U.S. Environmental Protection Agency has identified this type of self-sustaining biofiltration system as a best practice standard for green construction. Levi’s Stadium’s attention to water conservation, its efforts to utilize solar power, and its recent unveiling of an on-site 650-m2 (7000-ft2) vegetable farm are among many pursuits that earned the venue the 2017 Environmental Award of the Year from TheStadiumBusiness (West Sussex, U.K.).